It was a proud night for Te Ara's editing team when they received the Writemark New Zealand Plain English Award for best plain English website in 2008. 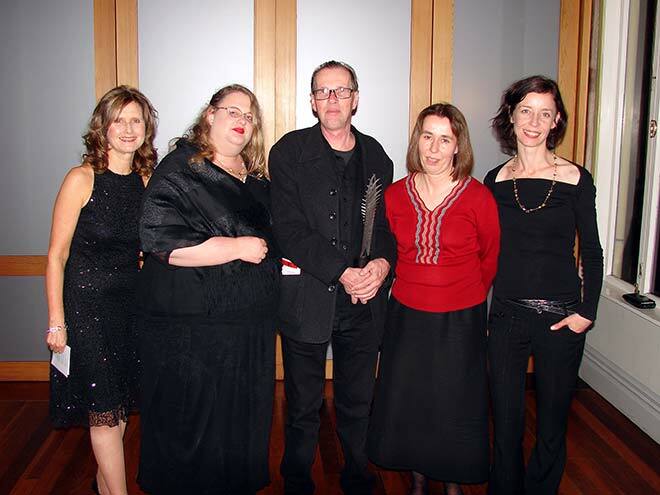 Seen here are (from left) Lynda Harris, CEO of Write, the sponsors of the award; and Te Ara editors Helen Rickerby, Ross Somerville (holding the award), Nancy Swarbrick (managing editor) and Fiona Oliver. Another editor, Caren Wilton, was absent. From its outset, Te Ara has been committed to reaching a broad audience, and has insisted on using clear and comprehensible language, even when explaining the most obscure or complex subjects.